EximiousSoft Banner Maker 5.47 Free Download - Create banner ads, buttons, headers, animated gifs etc. web graphics. EximiousSoft Banner Maker is a powerful software to build animated and static banner ads, Web buttons and headers and other web graphics. It provides more than 50+ special effects with which you can create your vivid banners in one step. What's more, EximiousSoft Banner Maker also provides hundreds of background image, preseted gradient style, textures, buttons and texts. Which would make your work is so easy, so quick. EximiousSoft Banner Maker works like a great image editor which supports strongly layer/object editing. It allows each object/layer has its own alpha channel. In addition, EximiousSoft Banner Maker provides some of powerful image filters such as bevel edge, drop shadow, outer glow etc. With it, you can create the most impressive banners which are looked with high 3D vision sense. In Banner Maker, to create, move, resize or rotate objects/layers only using drag or simple click mouse button. What's done is so easy and visual. EximiousSoft Banner Maker also allows importing shape objects or raster images. For each shape object even text,it can be filled or stroked with solid color, gradient colors, images, or patterns. But for each picture object, many image filters are used to apply for it. To create high quality GIF animated banners, EximiousSoft Banner Maker always maintenances a frames list which includes all image frames in your animation. Then just do such as &quot;add frames&quot;, &quot;Delete frames&quot; very comfortably. 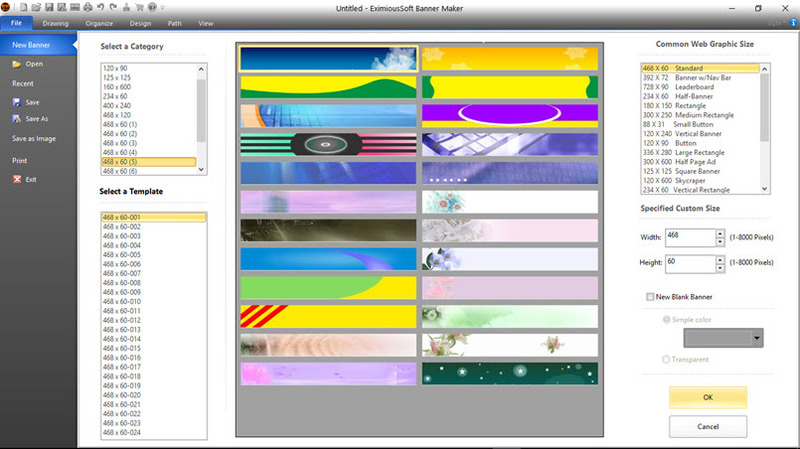 Anytime and anywhere &quot;Undo&quot; or &quot;Redo&quot; are supported by Banner Maker. You can also preview your work in Web browser directly. EximiousSoft Banner Maker support web graphics to be saved as GIF, JPG and PNG formats. Statement: First, please download the orginal installation package by clicking the download link. Of course you may also download it from the publisher's website. Using EximiousSoft Banner Maker crack, key, patch, serial number, registration code, keygen is illegal. The download file hosted at publisher website. We do not provide any download link points to Rapidshare, Hotfile, Depositfiles, Mediafire, Filefactory, etc. or obtained from file sharing programs such as Limewire, Kazaa, Imesh, Ares, BearShare, BitTorrent, WinMX etc. Software piracy is theft. If you like EximiousSoft Banner Maker please buy it.